The Peabody Award-winning NPR news show “Fresh Air” featured Unhinged on its July 13, 2010 show. 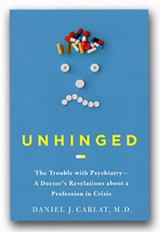 Guest host Dave Davies and I sat down to talk about Unhinged and the current state of psychiatry. Fresh Air is heard by 4.5 million people on 450 radio stations each week. Click on the link below to listen to the interview. This entry was posted on Wednesday, July 14th, 2010 at 5:07 pm	and is filed under Uncategorized. You can follow any responses to this entry through the RSS 2.0 feed. You can leave a response, or trackback from your own site.